Love The LEGO Movie? Take some of that movie love and expand it into reading love. I really enjoy finding things my son is interested in and offering him opportunities to expand on that enjoyment. The LEGO Movie Books are perfect for this. 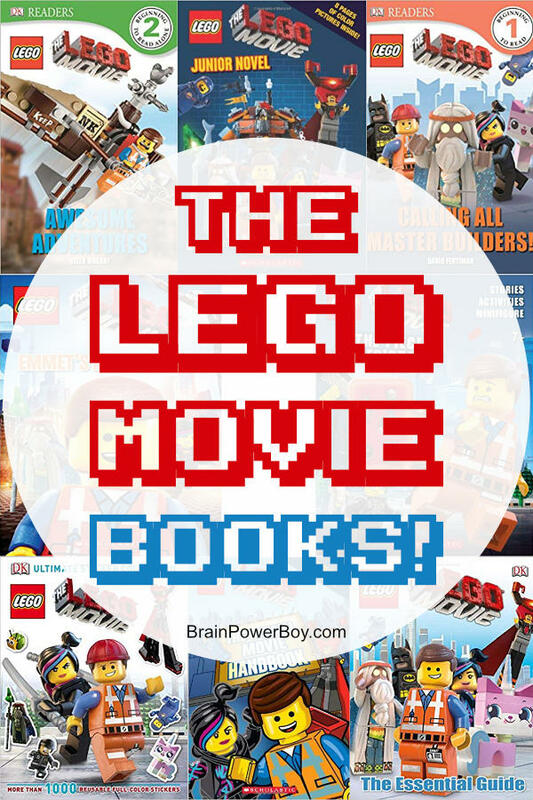 At Brain Power Boy we are big into offering the best books for boys and since LEGO is one of our favorite topics as well I thought combining the two was just too good to pass up. See all of our other LEGO books lists as well! It’s a match made in heaven. Take a look at this list and see if you can find a book or three or five for your son to read or an activity book for him to play around with. Please make sure you go all the way to the end of the page where I am linking to a really nice (and fun) free The LEGO Movie activity book for you and your boy to use. Enjoy! DK Readers L1: The LEGO Movie: Calling All Master Builders! : Level 1 reader (beginning readers.) Information about the master builders in the movie. Less of a story and more of a character guide. DK Readers L2: The LEGO Movie: Awesome Adventures : Level 2 reader (beginning to read alone.) Emmett’s Adventure through The LEGO Movie with the basic plot line of the movie. LEGO The LEGO Movie: Emmet’s Awesome Day : Beginning reader from Scholastic. Narrated by Emmet who tells of his adventure from The LEGO Movie. p.s. has one terrible review on Amazon but, really? it is just a kids book, not literature. LEGO: The LEGO Movie: The Official Movie Handbook : Written in comic book/graphic novel style this book tells a bit about each character and the lands such as The Wild West and Cloud Cuckoo Land. The LEGO Movie: Junior Novel : 144 pages long, 8 color picture pages. A junior novel of the movie storyline. For more cool LEGO readers try: LEGO Readers Book Series. The LEGO Movie: The Essential Guide (Dk Essential Guides) : I love these DK Essential Guides for so many reasons. My son spends hours reading them and looking at all the pictures. This particular one is a bit shorter compared to some of the others, around 65 pages, so I wanted to point that out. Still super though. I am including a few activity books here as well. Reading doesn’t always have to happen in a a fiction or non-fiction official book form. Puzzles and activity books are great ways for boys to practice their reading. Word finds, crosswords, and other games help improve word knowledge, vocabulary, and familiarity with language. All good! The LEGO Movie: The Piece of Resistance : Puzzles, stories and a buildable minifig. Ultimate Sticker Collection: The LEGO Movie (ULTIMATE STICKER COLLECTIONS) : Over 1000 stickers, some of them quite tiny, to use and re-use within the book. Or, why not use this great collection to have your boys make their own stories–creativity, reading and writing! There is another sticker book on Amazon but get this one, it has a ton more stickers and is much better quality. Plus it was only about $1.00 more for 850 more stickers at the time I wrote this. Free LEGO Activity Book from Warner Brothers and the LEGO Group. This is a high quality little pdf with printable pages. Includes coded message, word search, crossword puzzle, a word scramble and a few other things to do. Take a look at our Best Books for Boys list for more LEGO titles. Love that free activity book! Thanks for sharing! Thanks Branson, It is pretty great isn’t it? We are all LEGO all the time at our house and we’ve watched the LEGO movie dozens of times. Thanks so much for sharing these books. I can’t wait to download the free book. My boys will love it! Pinned to my LEGO board. I certainly understand all LEGO, all the time. So glad you liked the activity book link. Enjoy! Thanks for stopping by Cristy! You always have the best ideas. We haven’t seen the movie yet, but I can’t wait to check out the books and all the activities with him. We’re running out of things to do this summer, these are going to be a perfect thing to try! You are so sweet Alli-thanks. Be sure the print that activity book. It is a good one. Our Lego collection is growing and we can’t wait to own the Lego movie. Thank you so much for a great list of books to help feed our love for books and Lego! We got the LEGO movie from the library and enjoyed it. You are most welcome for the list–thanks for the comment! We haven’t seen the movie yet but my hubby and I are both big lego fans and can’t wait until the kids are old enough to explore their imaginations with it. I think lego books are a fabulous way to get boys – and girls- reading books! Yes, I like the LEGO books too and they are nice for some kids to use for reading. Especially the ones who are all LEGO, all the time. Hi Sheila, thank you for this resource, especially the free activity book. My little fella loves the lego movie and all things lego, I am sure he will enjoy this. Tara.